Riot police in Peru have fired tear gas to keep protesters away from Congress as thousands marched following the worst political violence in years. Protesters in towns and cities across Peru took to the streets in support of native Amazonians who oppose government plans for their ancestral lands. President Alan Garcia hoped it would ease tensions and allow time for negotiations between the government and indigenous groups. But indigenous leaders and opposition groups want the decrees overturned once and for all - and end government plans to allow foreign companies to drill for oil and gas in the Amazon. "The jungle's not for sale", chanted thousands of protesters as they marched on Thursday. 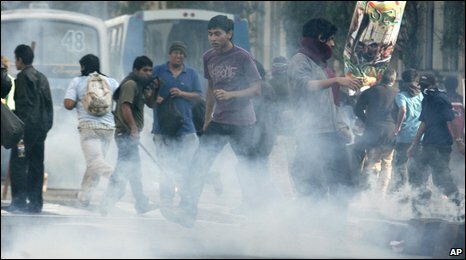 Some 20,000 students, labour union members and indigenous Peruvians were among the protesters. As the crowds marched on Congress, stones were thrown and riot police fired tear gas into the air. The protesters accuse the government of concealing the true extent of a confrontation at the end of last week when some 400 police officers moved to clear protesters blocking a road near the northern city of Bagua. About 24 police officers were killed, some while being held hostage by the protesters. Indigenous leaders say more than 100 protesters are still missing. The two suspended land decrees are among a series of measures issued by President Garcia that ease restrictions on mining, oil drilling, logging and farming in the Amazon. Indigenous people say the measures threaten their way of life, and would allow the government to sell their land to multinational companies. "That is something that the Peruvian people are now objecting to and it's generating a national protest all over the country," Javier Diez Canseco, of Peru's socialist party, said. The government denies it is overlooking the rights of indigenous people, saying it will guarantee them 12 million hectares (46,300 square miles) of rainforest. But, after last week's violence, trust in the authorities is at an all-time low, says the BBC's Dan Collyns in Lima.